How do you build a better smartphone camera? This is a question handset engineers have struggled with for the past five years, if not more. First we saw more megapixels, then better sensors and lens optics, and then companies went all in and just strapped mega lenses on the back (Samsung Galaxy S4 Zoom) or shoved in every possible megapixel (Nokia Lumia 1020). Add to this the growing number of cameras that come with Android and wireless connectivity built-in (along with a monthly fee) and it's clear that everyone is trying to come up with a way to give shutterbugs what they want: good optics and easy sharing and one-tap access to Instagram. Now it's Sony's turn with the introduction today of the Cyber-shot QX100 and QX10 Lens Cameras. At first glance the Cyber-shot QX models look like smallish lenses of the type you might attach to a Sony Alpha NEX camera. They're not just lenses, but complete cameras in themselves. Cameras with built-in Wi-Fi that can connect directly to an Android or iOS phone or tablet. When connected, the phone/tablet becomes the QX's viewfinder since neither Lens Camera has one of their own. Snap a picture with the QX100 or QX10 and it saves to a microSD card (if inserted) and/or to the device connected to it. 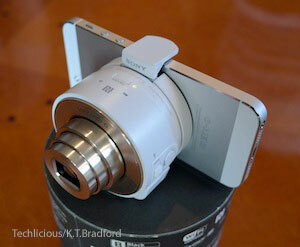 The QX cameras can even shoot video--and yes, you can use the phone/tablet as a viewfinder there as well. This is an evolution of the remote viewfinder idea we've seen from Sony, Samsung, Nikon and others that works with some Wi-Fi cameras. Using a tablet to control a camera is cool for when you want to be in the shot--group pictures, for instance--and saving photos right to a smartphone makes them that much easier to share. Doing this with a full camera, no matter how small, still isn't as easy or convenient as just taking shots with a smartphone alone. With the QX cameras that's not as much a problem. Both are small and fit into a pocket and, even better, both can attach to your smartphone so you don't have to hold two things. A spring-loaded bracket on the back stretches to accommodate phones as big as the Galaxy Note II and as narrow as the iPhone. You don't have to physically attach the lens to the phone if you don't want since the connection between the two devices is all wireless. Doing so does make it easier to frame a shot and to keep track of the lens cameras. Sony's signature PlayMemories app is getting a major update when the QX models come out. It will be possible to snap pictures, record video, zoom, and fiddle with auto focus and other advanced camera settings, too. Pairing the app to the QX cameras will be easier for Android owners thanks to the built-in NFC. Once you've done the initial setup, all it takes is tapping the camera and phone/tablet together to start the app and begin shooting pictures. You don't need to connect the cameras to a phone or tablet in order to take pictures as long as you have a microSD card in. Since the QX100 and QX10 don't have viewfinders of any kind, you won't see what the pictures look like until you connect to a mobile device. This harkens back to the days of film cameras where you didn't know for sure how a picture looked until you developed it and may appeal to the Instagram crowd, if no one else. Both of the QX cameras work in the same way but offer two different types of shooting experiences. The smaller of the two is the $250 Cyber-shot QX10. This 18.2-megapixel model has a 10x optical zoom, optical SteadyShot image stabilization, and Program Auto, Intelligent Auto and Superior Auto modes. It will come in black or white with gold accents. 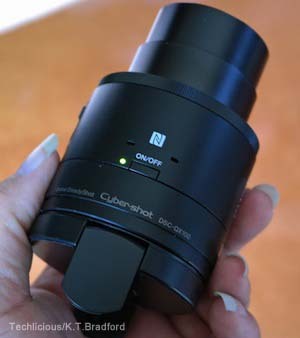 The larger Cyber-shot QX100 is longer and slightly heavier (not by much) and costs $500. This steep price is due to the more advanced optics available. The 20.2-megapixel sensor is the same as found in the Cyber-shot RX100 II, Sony's ultra compact high-end camera. The wide-aperture Carl Zeiss Vario-Sonnar T lens is speedy and offers 3.6x optical zoom and a powerful image processor. This model features a physical control ring for focus and zoom. In addition to the heightened hardware, you'll gain access to more modes with the QX100: Program Auto, Aperture Priority, Intelligent Auto and Superior Auto (automatically recognizes 44 different shooting conditions). Both QX cameras have tripod mounts on the bottom. The QX10 has little feet so it can sit up on its own as well. They charge via a micro USB cable and offer hours of battery life. The QX10 is more for the casual shutterbug, the QX100 is for more advanced photographers. Both will give you far better images than a smartphone. 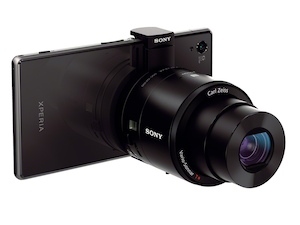 Sony's solution to the connected camera conundrum is not just novel, it's practical and versatile, too. The ability to turn any smartphone and, even better, any tablet into a really good camera with a single tap is pretty sweet. Since it works with almost every Android or iOS device, you don't have to worry about losing the functionality if you upgrade or lose the device. Winning all around. The Sony Cyber-shot QX100 and QX10 will be available later this month. Look for them and assorted accessories (including an Xperia phone case with a special mount) in Sony's online and retail stores later this month.